Nepal is a world of its own, and one we know well. Let us unveil it for you. Here in Nepal, amid the grandeur of lofty peaks that are a wish away, is the valley of Kathmandu. Crowded with the memories of 2500 years of civilization. Kathmandu, Patan, Bhaktapur - three cities that glorify the lives of bygone dynasties. Culture that sweeps you from the glamour of festivals to the throng and crowd of bazaars filled with life. Swift rivers, where the excitement of rafting hurtling rapids overwhelm you. The adventure of discovery, as your heart pumps with adrenaline and you rush past some of the most breathtaking scenery in the world. This follows down into jungles with wildlife, where deer and rhinoceros and tiger are just some of the many glories that await you. Elephant safaris take you from many starred jungle resorts into the heart of the wild. Or follow us into the mountains on treks that are tailor - made for you. 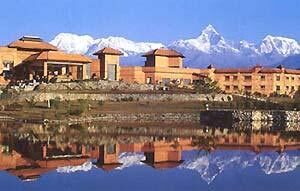 Easy ones that have you perambulating past the lake Valley of Pokhara where the snows are eternally reflected in the still waters.